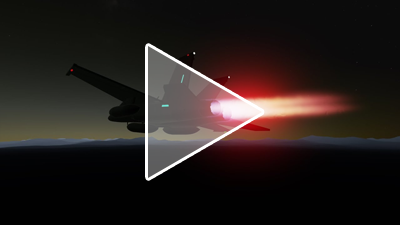 Come melt your face off with our latest jet engine addition to SimpleRockets 2. Put the throttle lever to the metal, and fulfill your need for speed. Full release notes can be found here. We really went all out on these. I hit the textbooks and learned about the thermodynamics of jet engines, (which are fascinating, btw) and Kevin created detailed, modular jet engine models. 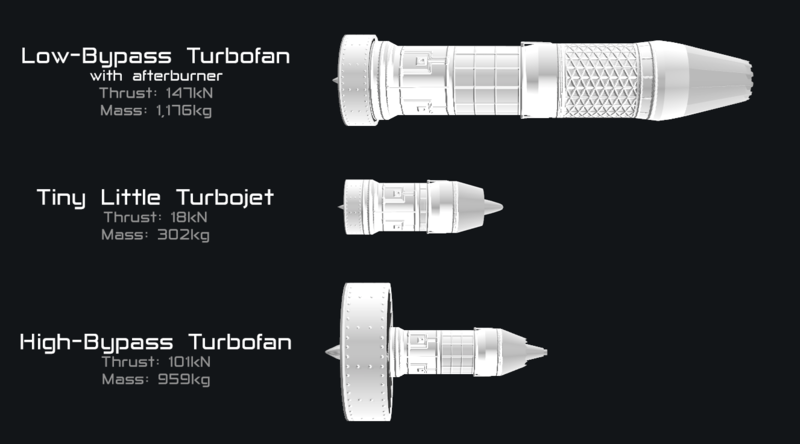 In the end, we have a highly procedural jet engine part that can be used to create anything from old-style turbojets to new low-bypass military turbofans to high-bypass civilian airliner engines. Jet engines need air to breathe, so the new inlet part helps to make sure your jet engines are getting enough air. 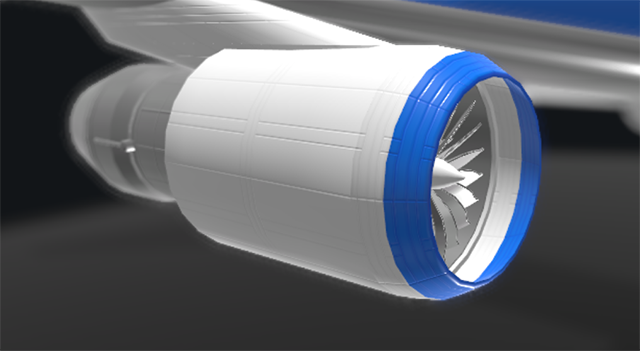 If you connect an inlet directly to a jet engine, it will only provide air to that engine. 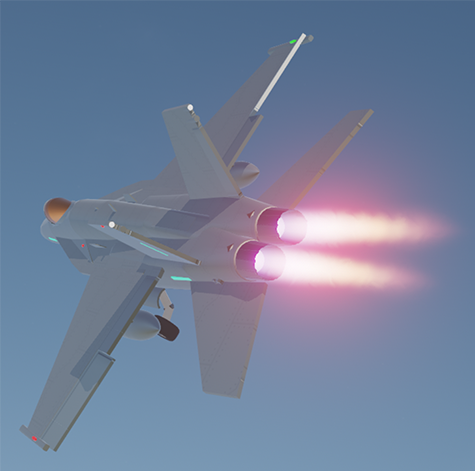 If you connect an inlet somewhere else on your craft, it will provide air to any jet engines that don't have sufficient airflow. 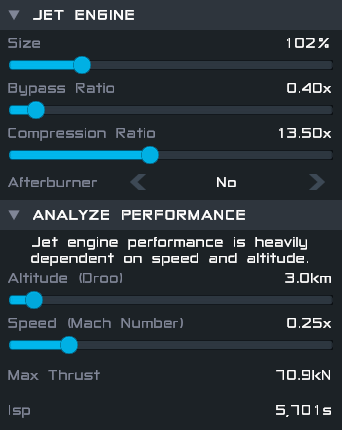 If you're curious about how your engines are doing, you can click on them during flight and check their Inlet Efficiency to ensure they are getting enough air. Of course, the fun doesn't stop there. Kevin built two new stock airplanes to show off the new jet engines. They are a blast to fly and it's fun to watch the new jet engines in action. Don't forget to turn on the new heat distortion particle effects for maximum enjoyment. What do you mean is not what you expected? @AndrewGarrison can you add the inlet angle option from Simpleplanes? Any idea for a release date on mobile? @AndrewGarrison - maybe "overall pressure ratio" could be added to the analysis panel as an output. @swope compression ratio is the compressor's exit pressure divided by the compressor input pressure. The overall pressure is 1.5 * CompressionRatio because the bypass fan has a fan pressure ratio of 1.5. @czenon1 @mjdfx150529 yep, I agree we need better landing gear. @HellFireKoder is working on those. Is "compression ratio" in the engine settings synonymous with "overall pressure ratio" or is it meant to be only input to the exit of the compressor? Is there going to be a SimplePlanes 2? Considering how large of a gap in terms of well, everything of how good SR 2 is compared to SP. @ZeDaru57 The runway is 2000m long. @SkiClad It won’t happen. This game wasn’t designed for it. Will Simplerockets 2 have small servers 10 -20 players max, and server part limit builds on multiplayer? Any word on the mobile port? I have no idea what those words mean but it looks cool!